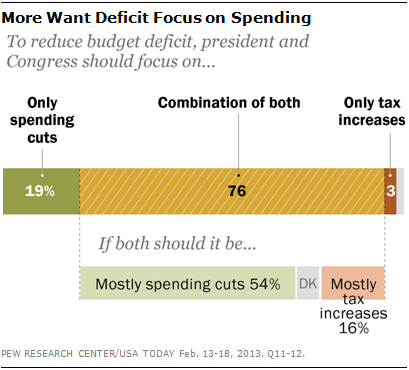 Budget Polls Show Americans Torn: To Cut Or Not To Cut? WASHINGTON -- To cut or not to cut, and if so, what? Those are critical questions facing President Barack Obama and congressional leaders as the automatic, across-the-board spending cuts known as the sequester are due to begin Friday. But policymakers will get little guidance on this issue from public opinion polling. Americans are of two minds on the federal budget: Large majorities say they want Congress to cut spending and reduce the deficit, but equally large majorities oppose the specific cuts necessary to make a meaningful dent. The latter attitudes seem to be more potent, though for the moment at least, American are not following the debate with rapt attention. The apparent contradictions on budget cutting were on full display in a new survey conducted by the Pew Research Center in collaboration with USA Today. They found that 70 percent of Americans -- including large majorities of Republicans, Democrats and independents -- said it is essential for the president and Congress to pass "major legislation to reduce the federal budget deficit" over the next year. These results are consistent with an earlier Pew Research survey in which 72 percent of Americans rated "reducing the deficit" as a top priority, second only to strengthening the economy and reducing unemployment. The newer survey also found that three out of four Americans (76 percent) want budget deficit efforts to focus on a combination of spending cuts and tax increases. However, a follow-up question found that spending cuts are much preferred over tax increases: 73 percent said deficit reduction should be mostly or only spending cuts, while 19 percent said it should be mostly or only tax increases. So it sounds like Americans are eager for Congress to cut federal spending and ready to make the tough choices necessary to eliminate the deficit? The very same February Pew Research survey also asked about a long list of specific spending programs and found overwhelming majorities rejected cuts in almost every instance. For example, most Americans want spending to be increased or kept the same on Social Security (87 percent), veterans benefits (91 percent), Medicare (82 percent) and military defense (73 percent). Even on the least popular spending category, "economic assistance to needy people around the world," roughly as many want spending increased (21 percent) or kept the same (28 percent) as want it decreased (48 percent). So how can so many Americans hold such seemingly conflicting attitudes simultaneously? One answer, suggested by Democratic pollster Mark Mellman, is that many individuals "start with a whole different set of assumptions" than those held by people familiar with the intricacies of the federal budget. "They start with the assumption that 50 cents of every federal dollar is in ... waste, fraud and abuse," Mellman said at a post-election panel in November. "If you started with that assumption, then it's true: You could cut taxes, cut spending, [and] still have enough money left over to eliminate the deficit." A Fox News poll conducted in January supports Mellman's argument. It found that nearly half of Americans (49 percent) agreed "we could eliminate most of the national debt if we cut waste and fraud from government," while only 42 percent chose the counter-argument, "we cannot make a significant reduction in the national debt without making painful choices about taxes and spending." Perhaps more important, the Fox News poll found that Republicans, who are generally more supportive of making unspecified spending cuts, are also more convinced that the federal budget is full of waste (58 percent) than are independents (47 percent) or Democrats (42 percent). Whatever the basis of these widespread attitudes toward the deficit generally and cuts specifically, some argue that Americans' concern about deficits is relatively malleable, while their opposition to specific cuts is more consistent, more consequential and, in the long run, more likely to drive the actions of the president and Congress. How much do Americans really care about the deficit? They may say it's a priority, but when asked to name the most important problem facing the country on recent surveys, far more name the economy than the deficit. Also, on questions that force a choice, polls show Americans prefer to spend more to help the economy than to spend less to reduce the deficit. 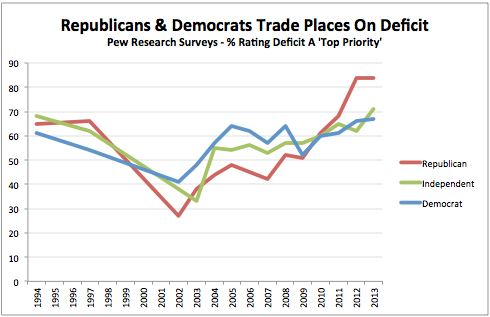 The trends over time show how deficit concerns are typically driven by partisanship. Currently, Republicans rate the deficit as a higher priority than Democrats do, but as the Pew Research report noted, "this represents a reversal from the Bush administration, when Democrats typically viewed the deficit as a more important issue." In President Bill Clinton's first term, partisan attitudes were once again reversed, with Republicans offering more concern about deficits. "Contrary to some recent media claims that the deficit is an issue average Americans care about," political scientist Michael Tesler concludes, "it appears that public perceptions of the debt's importance are fundamentally linked to which party is making it an issue." Finally, as political scientist John Sides has demonstrated, there is little relationship between the size of the deficit and whether a president wins reelection. "Americans don't punish presidents for large deficits," Sides writes, "they punish them for bad economies." Where does this leave the ongoing debate over sequester cuts? For now, most Americans are tuning it out. The latest Pew Research survey found just 27 percent said they were paying "a lot" of attention to the controversy, about half as many as the 50 percent who said the same about the debt limit debate two weeks before the debt limit deadline in August 2011. Many pollsters have been asking Americans to predict how they will react or whom they will blame should the automatic cuts go through, but the exercise is dubious. "The fact is, we won't know yet whether voters will react with mere frustration or outrage," writes The New Republic's Nate Cohn. 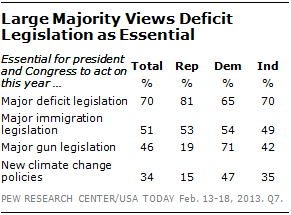 Much depends on whether the public wakes up and "finally pays attention" to the sequester debate.